JACKSONVILLE, NC. 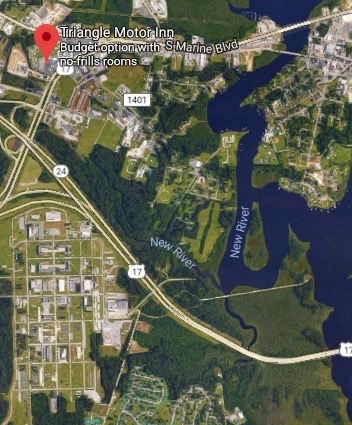 (THECOUNT) — Jacksonville, NC, officials have evacuated about 70 occupants, including children and pets, from the Triangle Motor Inn, located at, 246 Wilmington Hwy, Jacksonville, NC, after the structure became “compromised” after whipped by extreme winds compliments of hurricane Florence. About 70 occupants have been evacuated from a hotel after hurricane force winds threatened the structural integrity of the building. The 70, including an infant, children and their pets, have been taken to the Jacksonville Center for Public Safety while a solution is sought for where they can stay. No one was found to be injured, nor were any of them injured in the transport.